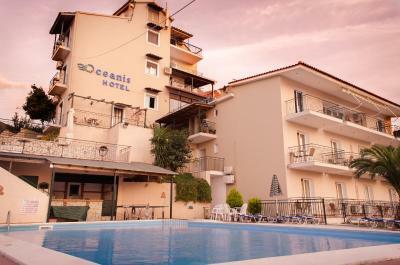 Lock in a great price for Hotel Oceanis - rated 8.6 by recent guests. Only 3 minutes from the harbor, this hotel gives a beautiful view of the bay. The manager speaks French which is appreciable. The hotel is clean, but out of season, the surroundings are empty and the pool unheated. The breakfast was good and fresh except the orange juice. The view from the hotel is awesome, even from the balcony of the cheaper rooms. You can either swim in the big and clean pool, or even better, go to the beautifull little "private" beach close by (almost never other people there). 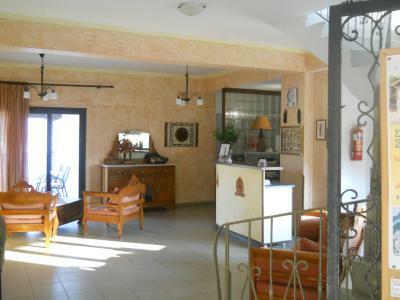 The rooms (and the whole hotel) are clean and good condition, the breakfast buffet is very nice. For dinner the nearby restaurant has good food, is very affordable, and the same awesome view as the hotel. You can make boat trips from the port, I can highly recommend that (I did the one to Fiskardo), to view the green mountains of Kefalonia from the boat is very beautiful, and the beach stop at the beach only reachable by boat is amazing. The hotel was at an elevated position giving a superb view from our balcony, overlooking the harbour and bay. The breakfast was an excellent spread, with something for everyone. The small terrace bar by the pool was an asset as it overlooked the bay and offered a range of drinks and light meals The staff were very helpful and friendly. A spacious, clean room. Great pool area. Friendly staff. An amazing buffet breakfast! "Agrapidos tavern" next door has fantastic food - the octopus is a must! It does get busy though so get in early or book a table. Great location to visit Antisamos beach - amazing - Melissani lake - also amazing but must get there when the sun is directly overhead as the colours are awesome. Simply-The wife didn`t want to come home. Says it all. 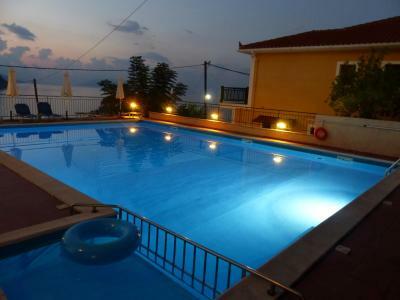 Okay so it`s not a 5 star property, with all singing and dancing stuff, but the views, the pool quietness (not many, if any kids!!) and all round relaxation. Family run, perfect for couples and also small children. Everything is setup on a way that you never have to leave hotel. Breakfast was really nice... Location of the hotel is apt and the staff is friendly. Wonderful family run hotel. Beautiful location and the view from the rooms we had were stunning. Loved the peacefulness and tranquility of the hotel. Great location for exploring the area and very helpful staff who told us of a beautiful secluded bay where we spent a terrific afternoon snorkelling!! 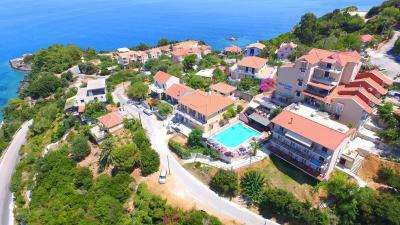 Hotel Oceanis is beautifully located in the picturesque coastal village of Poros, in Kefalonia, only minutes from the sea, enjoying great views of the Ionian Sea. All comfortable rooms feature balcony with view to the sea, and are equipped with air condition and fridge. Oceanis provides guests with internet access, a swimming pool, a TV room and a bar. Parking is also available on site. Poros has a 1.2 miles long coastline, abundant in sandy beaches and ports. The area is renowned as a fishing place, while its caves are a shelter for the seal Monachus-Monachus and the Caretta-Caretta turtle. The location is ideal to explore the beaches of the island and the surrounding landscapes. 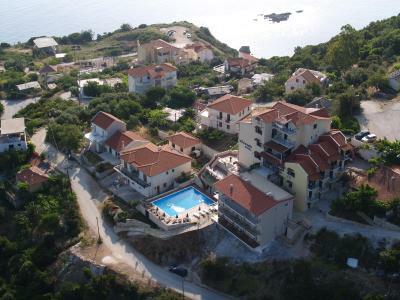 Hotel Oceanis has been welcoming Booking.com guests since 6 Jul 2009. The room provides one double bedroom with bathroom, air conditioning, TV and balcony with sea views. Please note that change of towels and cleaning services are provided daily, while sheets are changed every other day. 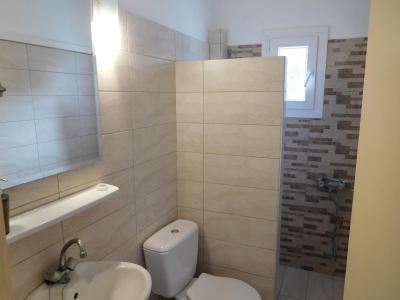 Includes air conditioning, TV and balcony with sea views. 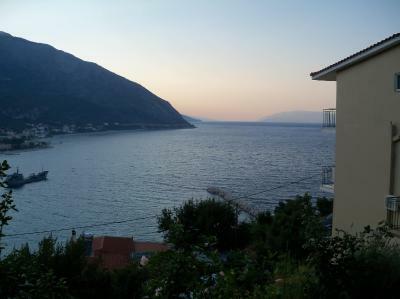 Includes air conditioning, TV and balcony with sea or village views. 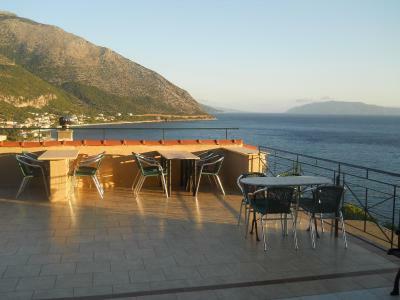 These rooms offer panoramic views of the Ionian Sea and Poros Bay. It includes air conditioning, TV and balcony. Please note that this room type is located on the ground floor. 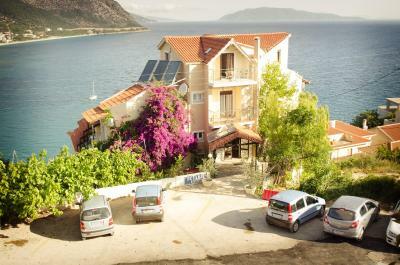 To begin with hotel Oceanis is managed by a family .They owned the initial property since 1990.The building at the front is since 2006 .However, they try every year to make important repairs so as to keep their property to a continuous renew condition. The extraordinary characteristic of the hotel is the fabulous sea view of the ionion Pelagos .The second characteristic that many guests have to refer is the cleanliness including daily room cleaning,daily towels change and every two days the sheets change. House rules Hotel Oceanis takes special requests - add in the next step! Hotel Oceanis accepts these cards and reserves the right to temporarily hold an amount prior to arrival. 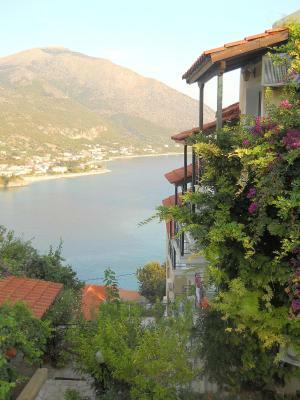 I didn't find the town of Poros very exiting (although the sourounding green mountains are beautiful). You should defintely rent a car to get around the island a bit. Also the coffee of the hotel was not drinkable, which I find a minor issue though (food was good). A proper shower rather than a shower over the bath, as this is always our preference. The room would benefit from some colourful pictures, for example, to brighten it up, but overall was excellent value for money. There was nothing about the holiday that we didn't like. 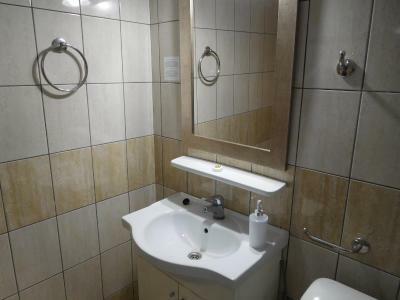 However the hotel is on a hillside and there are quite a lot of stairs and steps to the different accommodation levels which could prove problematic for anyone with limited mobility. The same applies for going down to Poros or more importantly coming back up - however the owner will happily transport you , free of charge, to the port/town and back. 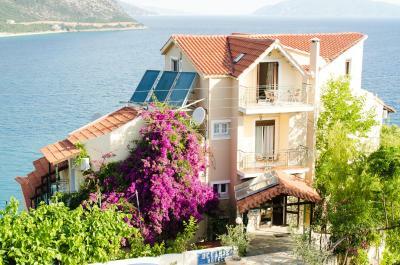 The outstanding experience of staying at the Oceanis hotel was the manner by which the owner and his family would go out of their way to offer a truly first class service and make your stay memorable - whether by arranging trips, offering a free taxi service into Poros or just being incredibly helpful and accommodating. Breakfast at the hotel offered a wide choice of food and as much as you needed. The bar above the pool (10am - 8pm) not only offered a good selection of drinks but a wide range of snacks and light meals that gave excellent value for money. 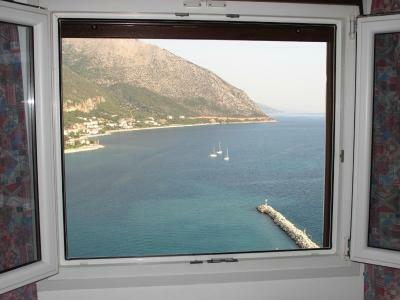 The room that we occupied had a balcony that overlooked the port with great views of Poros in general. The room itself was was adequate for our needs - comfortable beds, on-suite facilities, wifi etc and was cleaned everyday including fresh towels (if required) and bed linen changed every other day. There were also two excellent Tavernas within 2minutes walk of the hotel. For a total relaxing holiday our stay surpassed all of our expectations. 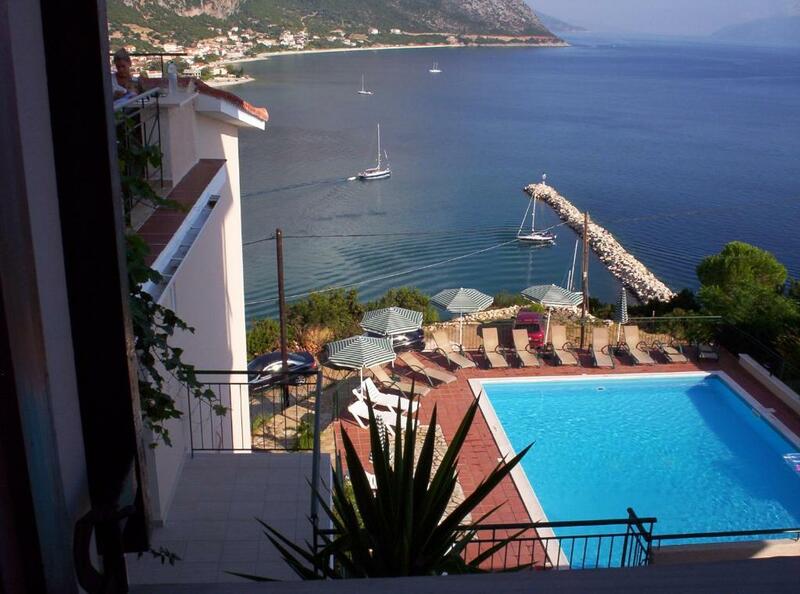 Exceptionally friendly and helpful staff and great pool with a spectacular view. Wouldn`t be suitable for less mobile, lots of stairs. No lift. A bit tired, could do with a refurb. Problem with wasps around food. Not just at this hotel but everywhere in Poros during daylight hours. Beautiful views across the bay. Close to 2 really good tavernas. Everything you may need, lovely pool, snack bar (reasonable prices) and the owner will run you into and out of town for free. Also laundry facilities should you need them. I enquired on how to use the machine and they offered to do it for me. Had it returned the next day dry and folded. Location of the hotel could for some people a problem. There are two ways uphill to hotel and do not listen to google maps. Take longer route. The breakfest was the same every day for 8 mornings. The beds were a bit plain, but comfortable. The hotel is located on a steep hillside and would have been difficult to reach without a car, especially with luggage. The road was narrow, and my wife didn't want to drive back down it for dinner, so we ate at a great taverna halfway down the hill (Agrapidos). 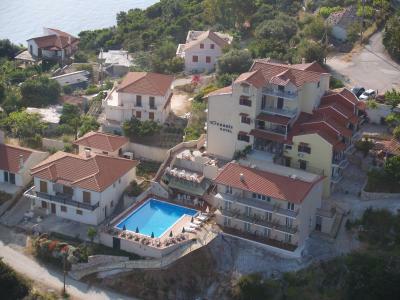 The hotel is located directly above the port of Poros, though it's a bit difficult to find--turn right and look for a road that turns sharply uphill to the left. The view from the room over the harbor is outstanding! The breakfast (included) was amazing--lots of choices, with tables both inside and outside. The pool was ample, but we didn't have time to use it.